Jennifer Meffert, Kate Perrin, Shelby McIntosh, Sarah Newall and Lacey Faeh. As a business owner in the public relations field I frequently am asked to speak on the job market, how to land a position, trends in the profession, skills needed for the future of PR, and the like. Those are speaking engagements that promote PRofessional Solutions and encourage professionalism in our industry. 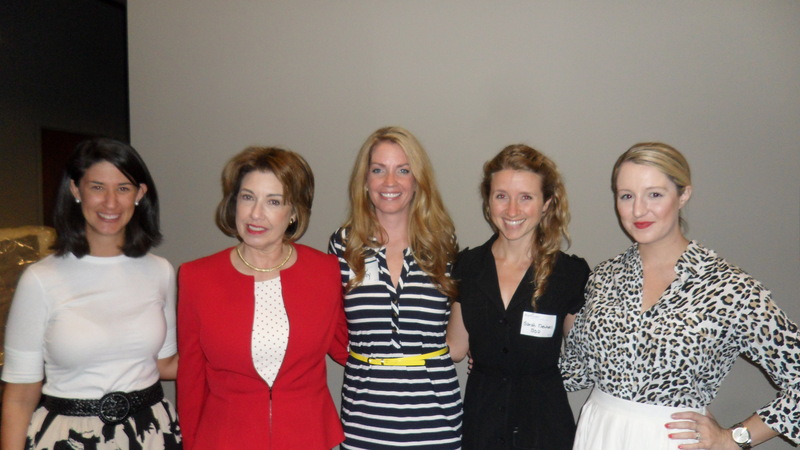 But some speaking engagements, like last night’s Lean In DC panel on “The Business of Balance” are from the heart. It was an opportunity to encourage and inspire young women (and a few brave young men) as they launch their work lives and navigate the confusing and overwhelming choices and challenges of building careers and satisfying lives. Seek balance in life, but not “work-life” balance, because work is life and a wonderful part of it. You can do ANYTHING, but you can’t and should try to do everything. Working hard and proving yourself while young yields wonderful rewards later in your career, so know that putting in the effort now will be worth it. The young women I met were smart and industrious and headed for great things. They are already “leaning in”. This entry was posted in PRofessional Solutions News and tagged career building. Bookmark the permalink.